The new £5 polymer bank note will enter into circulation on 13 September 2016 and, in preparation for this, the Bank of England has published training materials to help retailers identify the new security features. 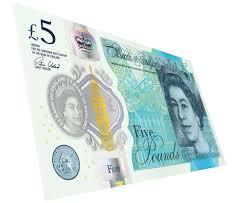 The new note will be smaller than the current £5 note and printed on polymer, which is a thin, flexible plastic material. Polymer notes last longer and stay cleaner. The notes will have advanced security features that make them more difficult to counterfeit. Machines that handle cash will need to be updated, and retailers should aim to do this before 13 September. The first step for retailers is to make sure they know which cash handling machines are used by their business, and then reach out and talk to their suppliers. For most machines, a software update will be needed. Staff need to be trained to recognise the new notes, and training materials are available free of charge from the Bank of England. For example, there’s a short video that introduces the key features of the new notes in just 90 seconds, a smartphone app, and a range of posters and leaflets. Read the training material. Are polymer notes easy to handle? Yes, polymer notes feel different from paper notes but they can be handled just as easily. Brand new polymer notes, like paper notes can sometimes stick together but this effect is short-lived once in use. New notes can be fanned or tapped on a desktop surface to make them easier to count by hand or machine. The new £5 note will be issued on 13 September2016, and by January, around half the paper £5 notes will have been replaced with polymer £5 notes. The current paper £5 note, featuring Elizabeth Fry, will be withdrawn from circulation in May 2017. The new £10 polymer note will be introduced in summer 2017, followed by the new £20 polymer note by 2020.